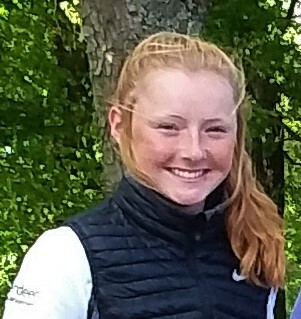 Louise Duncan (West Kilbride) scored a rare win by a Scot in the girls' section of the prestigious Fairhaven Trophies junior golf tournament at Fairhaven Golf Club, Lancashire today (Sunday). Louise (pictured) had rounds of 73, 71, 75 and 73 for a total of 292 - two shots ahead of runner-up Amelia Williamson with Caitlin Whitehead third on 295. Megan Ashley (Strathmore) (77-81 for 158) missed the cut by four strokes. In the boys' category, former Scottish boys champion Greg Dalziel (Airdrie) finished joint 16th on 292 (74-74-73-71), nine strokes behind the English winner, Conor Gough who shot 69, 75, 70 and 69 for 283, one stroke ahead of Swedish runner-up Adam Walin. 283 C Gough (Eng) 69 75 70 69.